These are our top choices for .380 ACP self-defense ammo. Developed over 100 years ago by the famous American gun designer John Moses Browning, the .380 ACP remains a relatively popular cartridge for self-defense and concealed carry. Though it's nowhere near as powerful as cartridges like the 9mm Luger, .40 S&W or .45 ACP, the .380 ACP is still a worthwhile self-defense choice under the right circumstances and with good shot placement. However, it remains a relatively low-powered handgun cartridge. For that reason, it's extremely important to use high-quality .380 ACP self-defense ammo. Unfortunately, that's easier said than done. Many of the .380 ACP self-defense loads either expand well but exhibit inadequate penetration, or penetrate very well but don't expand much at all. That being said, Lucky Gunner recently conducted an extensive test of a number of popular .380 ACP self-defense ammo loads using FBI standards in ballistic gelatin and a couple of loads did surprisingly well. In this post, I'm going to discuss why you should be using these specific .380 ACP ammo choices for self-defense loads in your Glock 42, Sig P238 or whatever .380 ACP carry gun you like to use. So, here are, in no particular order, our picks for the best .380 ACP self-defense ammo based on their performance in ballistic gel under controlled conditions. Unlike many of the other personal defense loads currently on the market, Hornady designed their Critical Defense lineup of ammunition from the ground up for use in short-barreled handguns during self-defense situations. These bullets are highly regarded for their reliable penetration and expansion at low-impact velocities. Featuring a polymer-tipped bullet that helps initiate expansion and prevents debris (like clothing) from clogging the hollow-point and adversely impacting expansion, the Hornady Critical Defense load is one of the best .380 ACP self-defense ammo choices available. If you'd rather use a more traditional jacketed hollow-point bullets instead of the polymer-tipped FTX bullets Hornady uses in their Critical Defense line, Hornady also sells .380 ACP self-defense ammo loaded with XTP JHP bullets. Instead of using a polymer tip to help initiate expansion, the XTP bullet has serrations in its jacket to help accomplish the same task. At the same time, the XTP also has a jacket of varying thickness along the length of the bullet, which controls expansion past a certain point and aids in penetration. All in all, Hornady successfully designed another great .380 ACP self-defense load with the XTP bullet. Though Sig Sauer is a relative newcomer to the ammunition business, their V-Crown ammunition has been well received by the shooting community. This .380 ACP self-defense ammo also uses 90-grain jacketed hollow-point bullets specifically designed for reliable expansion, weight retention and penetration. That being said, this ammunition expanded really well, but just barely achieved an average of 12 inches of penetration in Lucky Gunner's ballistic test. So, just keep that in mind when choosing your self-defense handgun ammunition. Speer has a well-deserved reputation for producing outstanding law enforcement and self-defense ammo with their Gold Dot line. 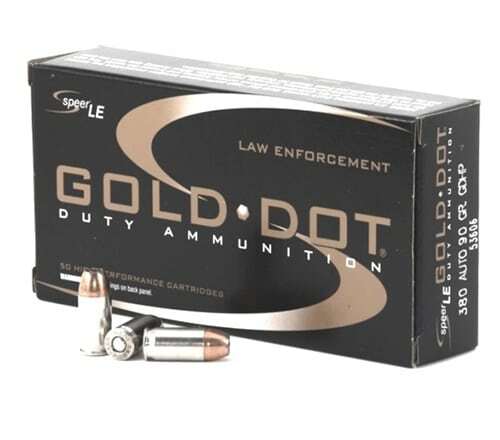 Honestly, there isn't much else to say about the Gold Dot here that someone else hasn't already mentioned: these bullets retain a large percentage of their weight, expand reliably, produce a massive wound cavity and have lots of stopping power. Unfortunately, while it the .380 ACP Speer Gold Dot ammo did relatively well overall in the Lucky Gunner test, it had an average penetration depth of 11 inches, which didn't quite meet the FBI recommended minimum 12 inches of penetration, though. If that worries you, stick with either of the two Hornady .380 ACP self-defense ammo choices. However, if you're not concerned, then the Gold Dot load will probably also work really well for you. These are far from the only good choices for .380 ACP self-defense ammo. For instance, like the Speer Gold Dot, the Winchester 95-grain PDX1, 95-grain Train and Defend, and 85-grain Silver Tip Super X loads all exhibited really good expansion, but subpar penetration (8.7-11 inches) in the Lucky gunner Test. The same goes for the 85-grain Magtech Guardian Gold. If you're ok with those results, then by all means use those loads for personal protection. On the other hand, the 90-grain Federal Hydra Shok and 99-grain HST penetrated way to much (22-25 inches) and didn't expand hardly at all. The Remington 102-grain Golden Saber had very erratic results with some bullets expanding and penetrating to the appropriate depth, but others failing to expand and penetrating much further. While it's OK to use full metal jacket ammo for target shooting and general practice at the range, you should still test out your chosen defense .380 ACP self-defense ammo at the range as well. Pick one or two loads and test their accuracy and reliability in your chosen carry gun. Different firearms often prefer different loads and bullet weights. The only way to know how they'll perform in the real world is to spend some time at the range.